Morris Berman, American historian, cultural theorist, and sociologist, is a starry eyed realist whose grim forecast of American demise makes him alone even in leftist circles. In the brilliant trilogy of books on American decline — “Twilight of American Culture,” “Dark Ages of America,” and “Why America Failed” — he surveys the political dysfunction, economic disrepair and cultural decay of modern America. Unlike most social critics, he does not end his analysis with a perfunctory prescription for revolution. Such optimistic talk, Berman makes clear, is the delusional noise of sounding brass and tinkling cymbals. After chronicling America’s birth as a “nation of hustlers,” and exhaustively mapping its mutation into a vicious playground for the rich and prison for the poor, Berman has turned his eyes and pen to the East. His new book, “Neurotic Beauty: An Outsider Looks at Japan,” is a bracing, fascinating and challenging exploration of Japanese culture, politics, and ethics. 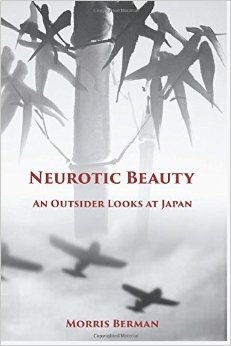 The product of a lifelong fascination for Berman, “Neurotic Beauty” not only examines Japanese history and contemporary culture, but also the relationship between Japan and America, the conflict between individualism and collectivism, craft traditions alternative to consumer capitalism, and the possibility that Japan might emerge as a “post-capitalist” model for economics and politics. I recently had the pleasure and privilege of interviewing Berman about his book, and his forecast for Japan and America. This entry was posted in Books, History, Japan, Politics and tagged American history, American Politics, Japan, Morris Berman by davidmasciotra. Bookmark the permalink.